As we will continue to be talking about over the next several weeks, river flooding remains a concern for the foreseeable future. 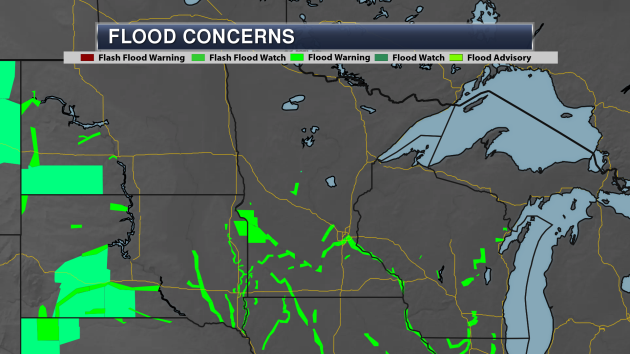 Numerous Flood Warnings covering area rivers continue to be in effect across southern Minnesota - some for ongoing flooding, and others for flooding that is expected to occur over the next several days. Here are a look at area river observations as of Saturday evening. 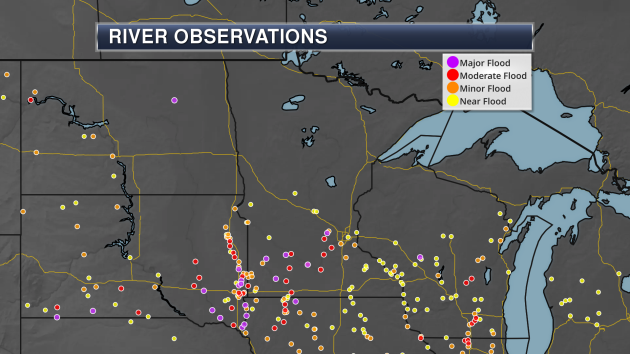 Several river forecast points are in moderate or major flood stage in southern Minnesota, including parts of the Minnesota, Cottonwood, and Crow Rivers. 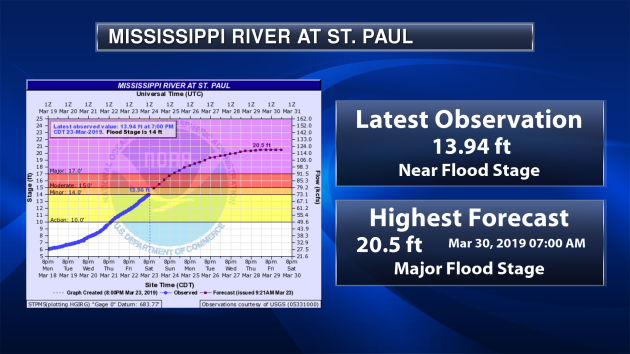 Here's a look at the Mississippi River at St. Paul, which as of Saturday evening was still near flood stage. The river will continue to climb over the next several days, quickly reaching major flood stage late Sunday or early Monday. Right now the forecast has the river reaching 20.5ft by the end of the week. 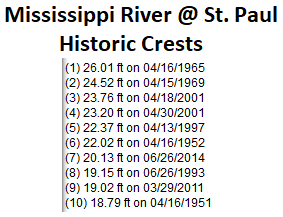 With the Mississippi River expected to reach at least 20.5ft next week at St. Paul, that would put this spring flooding in at least the top seven historic crests. As a note, at 17.5ft, Harriet Island will begin to become submerged. As of Saturday morning, we still had a pesky trace of an inch of snow on the ground at MSP airport, with 3" on the ground in St. Cloud and 6" at Eau Claire. The Twin Cities has now had at least a trace of snow on the ground in the morning snow depth report since January 19th. 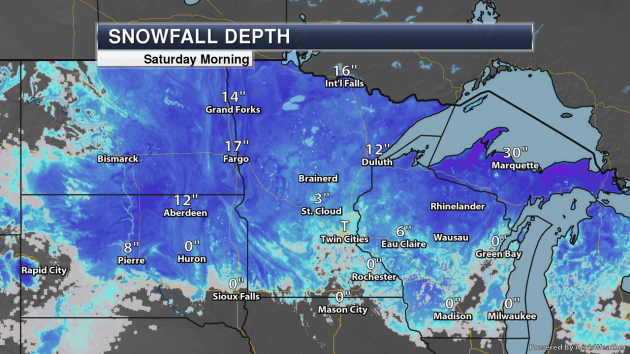 There continues to be a deep snow pack as you head into parts of northern Minnesota and eastern North Dakota, with 12" in Duluth, 17" in Fargo and 14" in Grand Forks. Especially across the Red River Valley, as that snow continues to melt it will pose river flooding issues. Forecasts are being updated for towns and rivers, but be sure to look at the trends over time. Is the peak crest increasing or decreasing over time? Will it happen sooner or later? Step back and take in the bigger picture. Last week on my WCCO Radio show with Jordana Green, Dr. Mark Seeley said: "I think the probability for the projected flood levels in southern MN watersheds to rise in the next week or two is more likely than the Red River Valley watersheds. 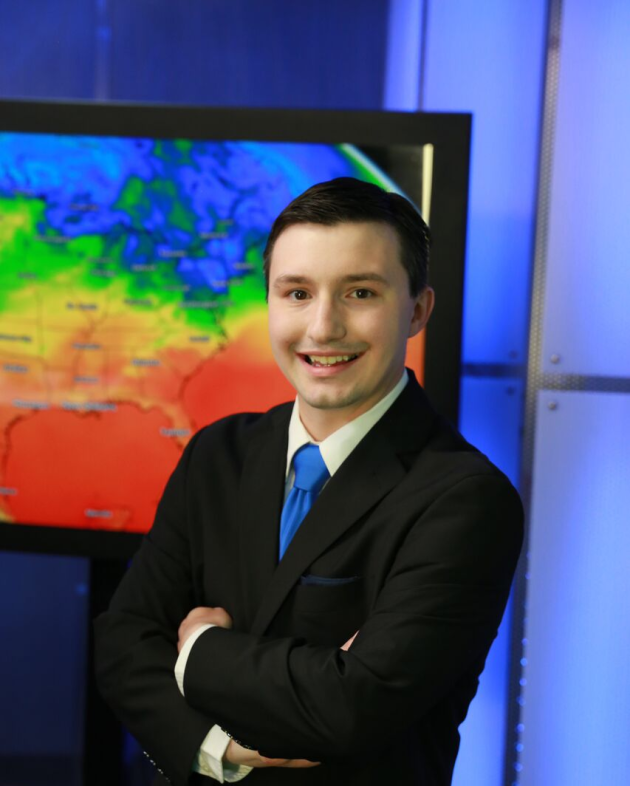 That is because the storm tracks will affect the southern geography more than the northwest, and that the thaw will be slower in the northwest." Showers stay to our south today; the best chance of heavier rain next Friday over southern Minnesota. 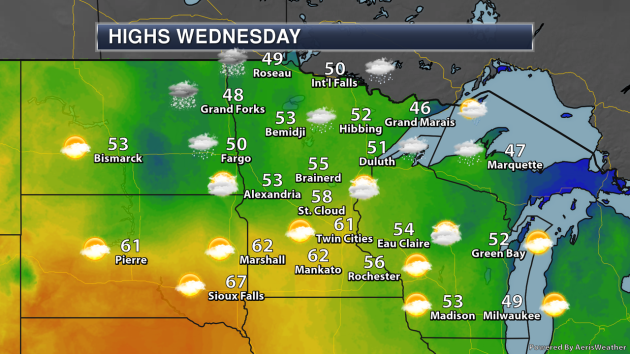 In the meantime 60F is possible Wednesday, with low 50s for the Twins Opener. 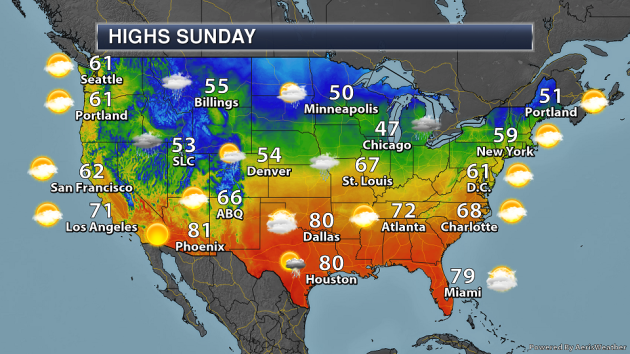 SUNDAY: Clouds, few sprinkles. High 49. Low 22. Chance of precipitation: 20%. Wind NE 10-15 mph. MONDAY: Sunny and cooler. High 43. Low 28. Chance of precipitation 0%. Wind E 5-10 mph. TUESDAY: Patchy clouds, breezy and milder. High 53. Low 43. Chance of precipitation 10%. Wind S 8-13 mph. WEDNESDAY: Serious case of spring fever. High 60. Low 46. Chance of precipitation 10%. Wind SW 10-15 mph. THURSDAY: More clouds, cooler for Twins Opener. High 52. Low 40. Chance of precipitation 20%. Wind N 8-13mph. 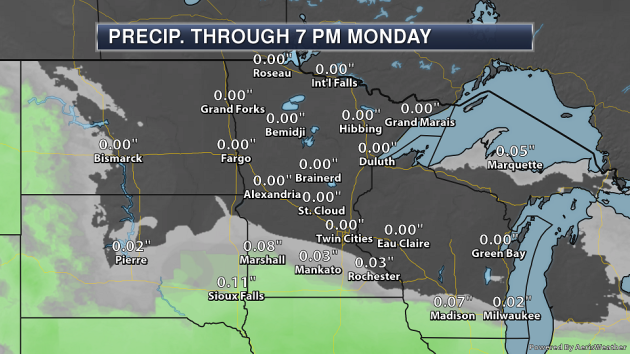 FRIDAY: Cold rain or mix southern Minnesota. High 42. Low 28. Chance of precipitation 70%. Wind NE 10-20 mph. SATURDAY: Mostly cloudy with a raw wind. High 43. Low 23. Chance of precipitation 20%. Wind NW 15-25 mph. 1851: Minnesota experiences an early spring 'heat wave' with 60s and 70s common. 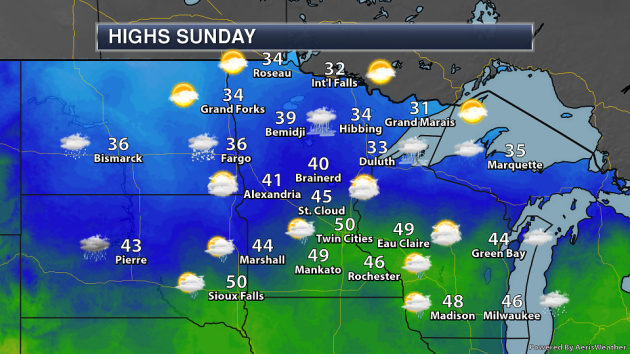 On Sunday, a system off to our south will help spread a few light rain showers across southern Minnesota. A cold front diving in from the north could also produce a few areas of drizzle or freezing drizzle in northern Minnesota. 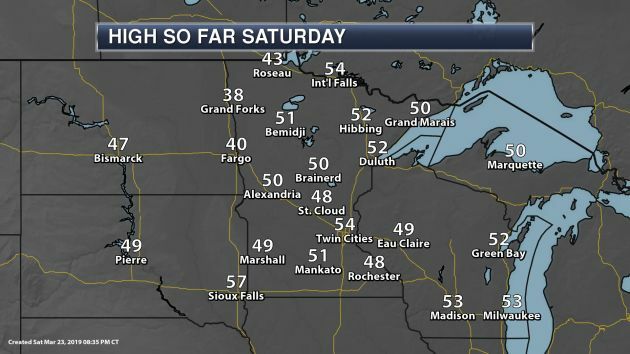 Highs are expected to climb into the 40s and low 50s across the southern half of Minnesota, and only into the 30s in northern parts of the state. 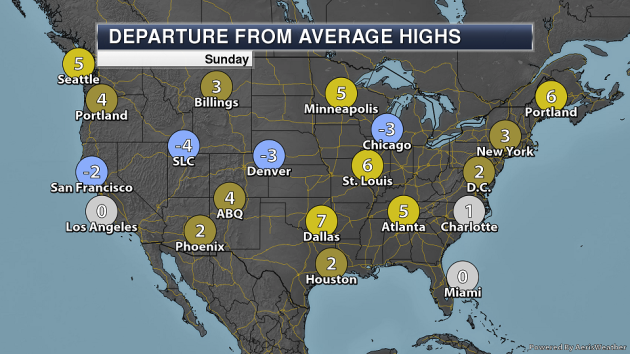 Highs across much of the southern half of Minnesota are expected to be above average on Sunday, with below average temperatures in northern Minnesota. 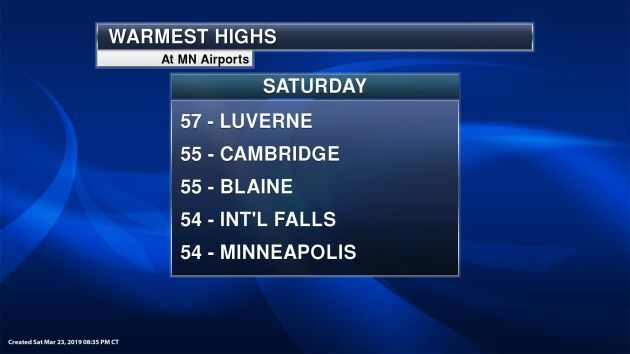 The average high for March 24th in the Twin Cities is 50F. 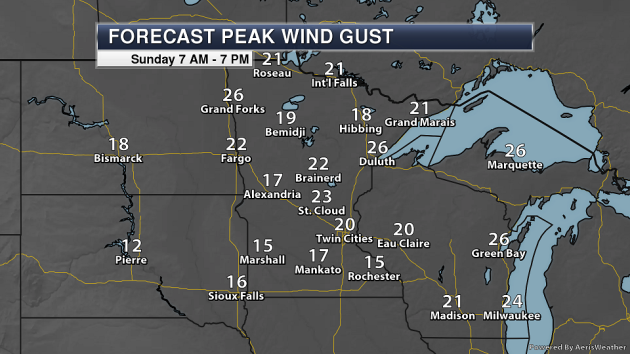 Strong east to northeast winds behind the cold front are expected Sunday with some areas expected to see wind gusts of at least 20 mph, especially during the afternoon hours. Any rain that does fall with these showers through Sunday is expected to be light across southern Minnesota - generally under a quarter inch. 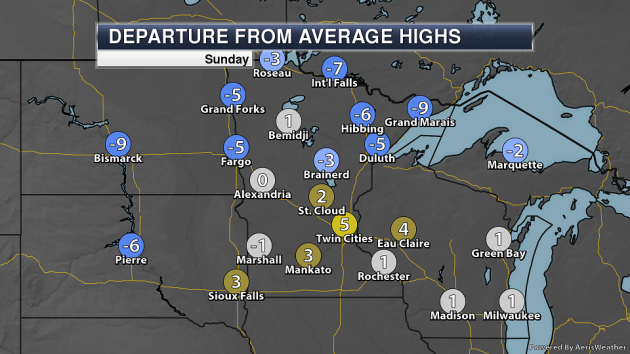 After our warmth on Saturday, the next few days will be a bit cooler behind that cold frontal passage Sunday with highs only in the 40s on Monday in the Twin Cities. A quick warm up occurs toward the middle of next week, and as mentioned above that could bring the first 60F high to the Twin Cities in 2019 on Wednesday. Another blast of cooler air moves in toward the end of next week, knocking temperatures back downward once again. Besides our slight chance of rain Sunday in the Twin Cities, it looks like we'll continue a fairly quiet stretch of weather precipitation-wise into the middle of next week. That changes as we head toward the end of the week, when we do have to start watching the potential of showers and maybe a few storms. There are model differences the overall evolution of the forecast late next week, but we'll keep an eye on that rain chance, especially in relation to snowmelt and river flooding across the region. On Sunday, a system moving through the central United States will bring rain from parts of the upper Midwest and northern Plains into the lower Mississippi Valley and the Ohio Valley. 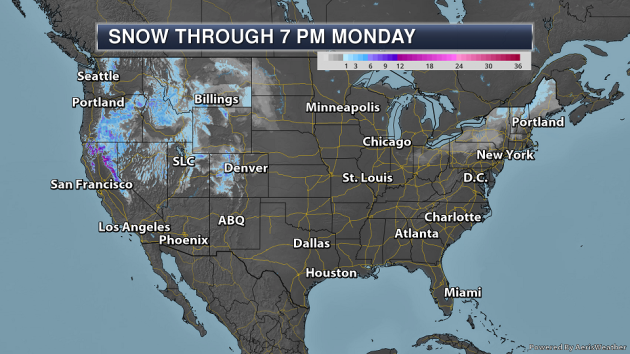 A second area of low pressure will bring rain and snow to the northern and central Rockies. A cold front diving south out of Canada could produce a little drizzle or freezing drizzle from North Dakota into the U.P. of Michigan. 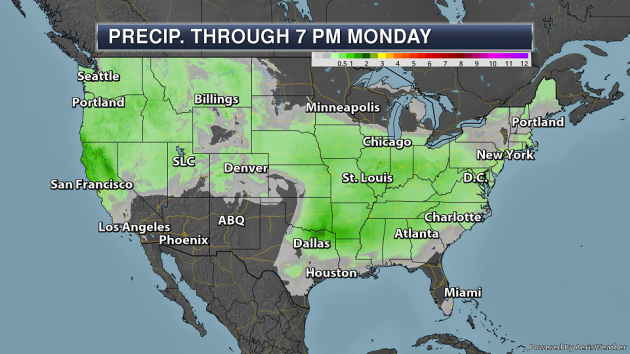 Two areas of heavier precipitation are expected through Monday evening across the lower 48 - one across parts of the Southern Plains, and another in parts of northern California. In some of these areas, precipitation amounts of 1-2" are possible. The heaviest snow will be out west, with some areas of the northern Sierra potentially picking up over a foot of snow. Meanwhile, heavy snow fell Friday into Saturday across parts of the Northeast, despite the calendar indicating that we are in spring! 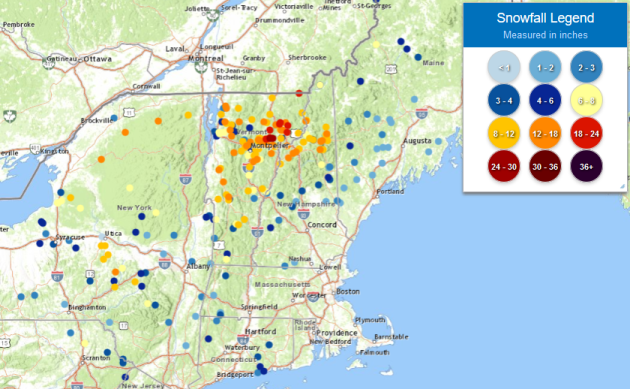 There were several reported totals of over a foot from New York State into Vermont and New Hampshire, but the overall heaviest snow fell across parts of Vermont. That's where we did see two totals of at least two feet with 24.4" near Danville, VT (near Joe's Pond), and 24" near Walden, VT (at 1,640 ft). More from CNN: "Farmers in parts of Nebraska and Iowa had precious little time to move themselves from the floodwaters that rushed over their lands last week, so many left their livestock and last year's harvest behind. Now as they watch the new lakes that overtook their property slowly recede, some have a painfully long time to reflect: They lost so much, staying in business will be a mighty struggle." More from NIDIS: "Based on preliminary analysis within the National Climate Report - Annual 2018, produced by NCEI, 2018 ranks as the 14th warmest and 3rd wettest year on record (1895-2018). Even with the above-average precipitation observed, much of the nation, primarily in the Southwest and Southern Plains, experienced persistent and severe drought conditions. Using data from the 52 weekly U.S. Drought Monitor (USDM) maps published during 2018, NCEI generated annual maps to provide a snapshot of drought in the U.S. during the year." More from Climate News Network: "With a little help from ocean heatwaves, the world’s seas are changing. Researchers in California can now name 37 species that have shifted their range further north than ever before in response to unusually hot summers in the eastern Pacific. In the years 2014-2016, the pelagic red crab Pleuroncodes planipes was spotted off Agate Beach, Oregon, a full 595 kilometres further north than ever before. A deepwater invertebrate called the black-tipped spiny dorid Acanthodoris rhodoceras also made it to Oregon, 620 kilometres from what had previously been its most northerly range."